Planned maintenance is necessary for emergency safety showers or equipment to perform correctly. At Empteezy, our focus on safety is paramount and instead of simply going through a process of self-certification, we went the extra mile and elected to have our tepid water emergency tank shower SE-VTS-1 undergo independent tests to prove its compliance to international standards. Prior to the ANSI Z358.1, legislation was quite vague on what constitutes “suitable facilities” for drenching the eyes or body. In order to provide clarification, the American National Standards Institute (ANSI) have created a suitable standard intended to provide guidance on the proper design, certification, performance, installation, use and maintenance of emergency equipment. It is important to understand the emergency safety shower testing requirements and conduct a series of maintenance checks throughout the year. Our guide will help ensure your safety equipment remains in peak condition and ensure you are meeting testing requirements. Weekly testing will clear supply lines of the sediment and bacteria build up that can occur in stagnant water and also allows you to verify the equipment’s operation, ensuring flushing fluid is available. However, annual testing requirements dictate a more detailed approach. You must verify the operation of heaters and chillers where appropriate and any trace tape heating or insulation must be inspected and repaired where necessary. Even the flow pattern/rate should be checked against ANSI standards. The Health and Safety Executive consider equipment like emergency safety showers to be lifesaving. By carrying out regular checks and servicing, you will help satisfy any HSE inspection and show the equipment is well maintained. Remember to keep a record of all maintenance activity, detailing any repairs undertaken including all activations. COSHH (Control of Substances Hazardous to Health) regulations require that safety equipment is “maintained in an efficient state, in efficient working order and in good repair” and that records are kept for a period of at least 5 years to prove the inspections and maintenance work has been carried out. PUWER (Provision and Use of Work Equipment Regulations 1998) regulations require that where inspections are carried out, they should be undertaken by a competent person and a record kept until next inspection. As part of the ANSI requirements, the shower should be clearly identified with a visible sign, and the area surrounding the emergency safety shower be well lit. Maintenance staff should regularly check the area is clearly signposted, lights are in full working order and the area clear from obstruction. 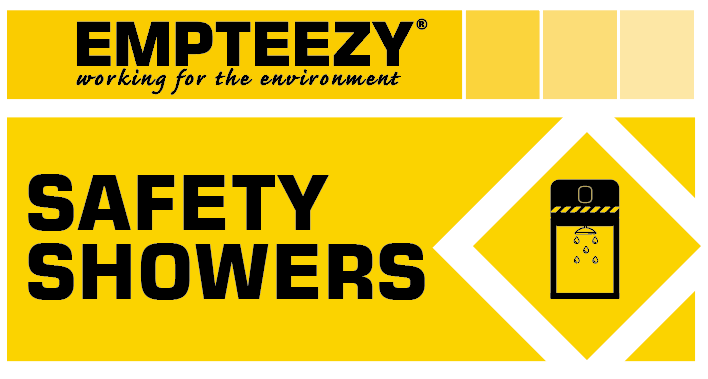 At Empteezy, we have a range emergency safety showers and equipment. From our emergency tank showers, designed for locations that have no running water to our portable eyewash stations, browse the range and ensure you are fully compliant. Whny not explore our range of Emergency Saftety Showers? This entry was posted in Emergency Safety Showers, General. Bookmark the permalink.